The wave of democratization in the 1980s has produced a vast literature on transition from authoritarian rule, especially the military type. 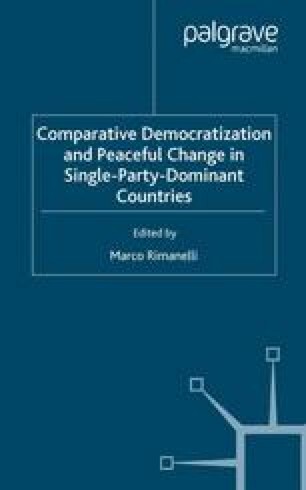 The transition literature has attempted to explain rather convincingly the variety of paths towards democratic politics.1 Argentina and Brazil moved away from military authoritarianism with different means and at different times. Argentina ended its military rule in 1982 abruptly and with some help from exogenous conditions in the form of a military-induced, disastrous war with Great Britain over the Falkland/Malvinas Islands. Brazil, on the other hand, moved towards democratization in the late 1970s under the tutelage of the military, which tried to control the increasing uneasiness of élites and masses over the slow progress towards civilian-led democratic politics.2 The Brazilian military sought to manage the transition to civilian-led democracy by establishing manipulative alliances with key élite sectors of civil society, while the Argentine armed forces were unable to link up with the political world. The mode, strategies, and timing of régime transition are not uniform, even in a regional context such as Latin America where countries share several similarities. One of the key experiences Argentina and Brazil have shared is a cycle of democratic and military “bureaucratic authoritarianism” from which they are trying to escape.